I take comfort in facts; irrefutable, set in stone, proven beyond a shadow of doubt,snippets of information used to define our world. The Oxford Dictionary defines fact as “a thing that is known or proved to be true”, so far so good, right? Not so fast – fact missed the memo on truth. I know for a fact we can’t pin point the exact age of our universe. Science says 13.8 billion years, give or take a millennium or two. We have no way of ever assigning “fact” to age, we can however say for a fact, the universe is billions of years old, science has proven this to be true. According to fundamentalist Christians the world is 6427 years old. The link below gives a timeline of their reasoning – for those requiring “proof”, a search on yahoo resulted in “best answer” rating for a response to the question “how old is the earth according to the bible?” – “the Bible doesn’t specify how old earth is but the lunar landing proved only 6000 years of dust had collected on the moon”. Yikes; that’s one hell of a fact. How about the “fact” Christopher Columbus discovered America – he never set foot on the continent, his 1492 landing was in the Caribbean – I suppose “close enough” makes for good historical “fact”. Leif Erickson found Newfoundland long before Columbus sailed the ocean blue – that’s a fact. Columbus Day based on historical fiction; truth bent so long as to become “fact”. We need to take a long hard look at what we consider fact. Considering the source, burden of proof and context go a long way towards definitive truth. It isn’t good enough to say “I heard it on TV” or “the Bible says…” We need to understand that history , more precisely “historical accounts”, are often nothing more than one side of the story. We need to stop and ponder the difference between belief and fact. One year has 365 days, 1+1=2; facts beyond a shadow of a doubt – foundations on which we build our view of the world. 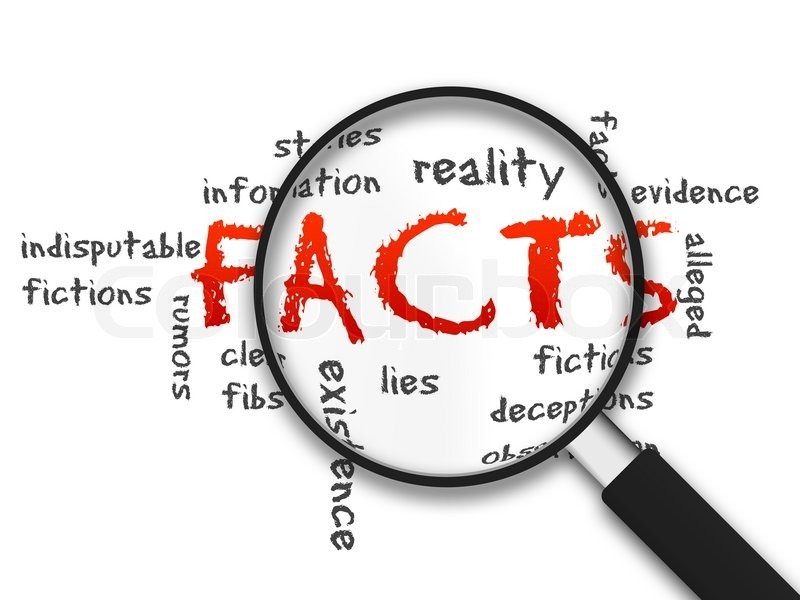 Using “fact” in the context of biblical or historical accounts, takes fact from the realm of truth, to that of speculation. History is not without bias; historical accounts often written from verbal folklore, or as a one sided “white washing” of the facts. Alexander Graham Bell is credited with inventing the telephone – dead wrong, it was Antonio Meucci, a penniless Italian immigrant who couldn’t afford to patent his invention.Biblical “fact” based on a book neither proven or known to be true. We can say for a fact the bible claims Jesus performed 37 miracles, we can’t claim they are proven or true. “Facts” are solidified only when proven to be true. Statistics aren’t “fact”; statistics are nothing more than a snap shot of one tiny demographic. Statistical “fact” based on responses from a few thousand hand picked respondents. Editorial news stories aren’t fact, simply the opinion of a network or newscaster. We’re bombarded with “facts” based on nothing more than opinion or public relations firms presenting one side of the story. Fact has little to do with proven truth – fact and truth parted ways some time ago. I can say for a fact that NOAA scientists reported November 2013 to be the warmest November since records began in 1880. November was also the 37th consecutive year, and 345th consecutive month where global averages of ocean and surface temperatures increased. Compelling facts but not irrefutable proof of global warming according to websites like thewatchers. Fact is open to interpretation – a nasty backlash since parting with truth. We all need to ponder the importance of getting our facts straight. Basing our statements of fact on the Bible, history textbooks, worse still, opinionated media or websites, makes us look silly. Bible stories or Scientology beliefs that humans are inhabited by the souls of an alien race from planet Xenu – bear no resemblance to fact; the only true fact being many people believe these stories. Teaching for a fact that Mesopotamia was the cradle of civilization, ignoring Gobekli Tepe, Varna, Puma Punku simply because we lack reasonable explanation, doesn’t change the fact these places blow our mainstream historical timeline out of the water. We owe it to ourselves; not only remind ourselves of “facts” true meaning, but to expand our children’s minds with unbiased truth – science might not be able to explain, it doesn’t negate scientific truth. Ponder a world if we based our lives on factual truth rather than biblical references, historical hearsay, media opinion or statistical slants. Stop and think how different it would be if our lives were governed by fact based on truth instead of opinion. How simple life would be if a fact was a fact – so deal with it. A world where believe in your God ,or not , was irrelevant when educating our children. A place where “this is what we can back up with archaeological evidence” or “this confounding truth defies explanation, yet is no less real”. A world where kids grew up with all the “facts”, were allowed to imagine and wonder, form their own ideas and taught to recognize the difference between fact and hogwash. Fact needs to high tail it back to truth; our world needs to focus on what is proven to be true rather than how we believe, or would like to think the universe is ordered.